If you have shoulder pain, you may benefit from the skilled services of a physical therapist to help determine the cause of your pain and to restore normal mobility around your shoulder joint. Your PT can assess your condition and teach you the right things to do to get your shoulder moving again. There are many causes of shoulder pain. If weakness is found in your shoulder and rotator cuff muscles, your physical therapist may use specific exercises to help improve the strength and muscular function of these muscles. The dynamic isometric rotator cuff strengthening exercise is a great exercise to perform to help improve the function of all of your rotator cuff muscles. The exercise is simple to do with a friend or family member and an elastic resistance band. After surgery when you are trying to engage your rotator cuff muscles. As a progression from basic shoulder isometric exercise. To improve neuromuscular recruitment of your shoulder and rotator cuff. 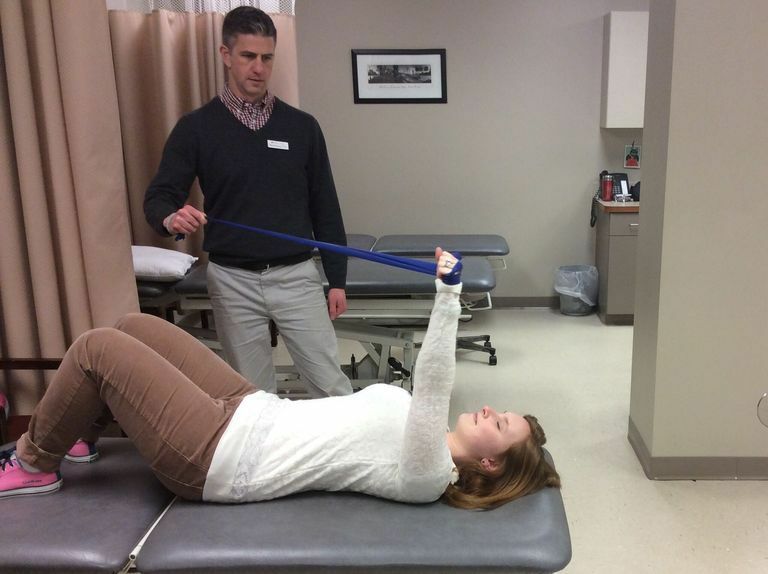 To improve upper extremity proprioception. To improve stability around your shoulder joint. Before starting the dynamic isometric shoulder strengthening exercise, check in with your doctor or physical therapist to be sure the exercise is safe for you to do. To perform the dynamic isometric rotator cuff exercise, first, obtain an elastic resistance band from your local physical therapist. Lie on your back on a firm bed or on the floor. Hold one end of the resistance band in your hand. Have your friend hold the opposite end of the band. Hold your arm straight up in the air with your elbow straight. Have your friend pull on the band so that it is taught. While your friend keeps tension on the band, have him walk around you in varying directions. Make sure to keep your arm straight and pointed straight up towards the ceiling. You friend can walk around you in different directions for about 1 or 2 minutes or until your shoulder feels fatigued. While your friend is walking around you, he or she can vary the amount of resistance on the band to challenge your rotator cuff muscles more. That way, your shoulder has to respond to both varying directions and the varying resistance on the band. To improve your upper extremity proprioception or spatial awareness, simply perform the exercise with your eyes closed. The dynamic isometric shoulder exercise can be performed 1 or 2 times a day or as often as prescribed by your physical therapist. Be sure to stop the exercise if you are feeling increased shoulder pain, as this can be a signal that something bad is happening to your shoulder or rotator cuff. If you have shoulder weakness or pain or if you are recovering from shoulder surgery, you may benefit from isometric shoulder strengthening exercises. The dynamic isometric shoulder exercise is a great way to add a little variation to your isometric routine and train your muscles to react to various forces that you may encounter throughout your day.